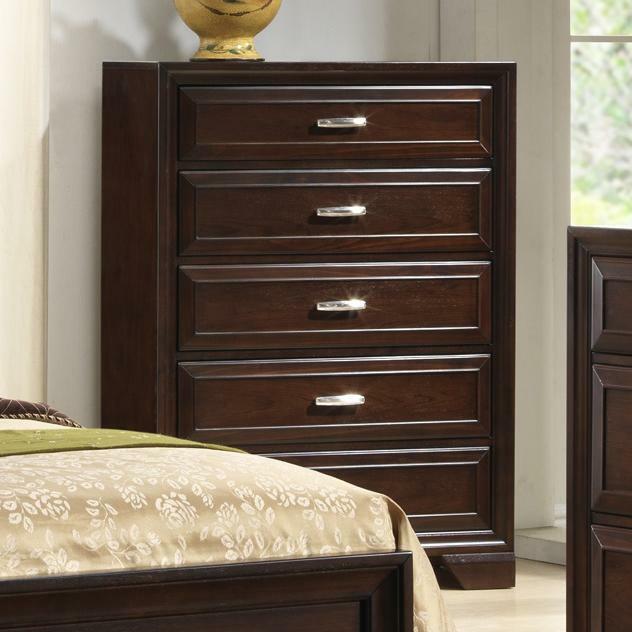 Add extra storage space to your bedroom with the Jacob Chest of Drawers. 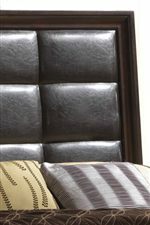 Finished in a deep, dark brown, it has a rich finish to enliven your bedroom. Five drawers offer plentiful space for clothing, apparel, and other bedroom accessories. Tuck away shirts, pants, sweaters, and linens within this chest and stay clutter-free and organized. Subtle paneling on drawer fronts offers visual depth and dimension to its design, while sleek hardware pulls add additional accent to please. Lifted on bracket feet, it has a spacious top for placing decorations to uplift your home. 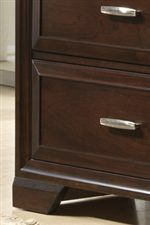 Pair with the coordinating dresser for even more storage in your master suite. The Jacob Chest of Drawers by CM at Michael's Furniture Warehouse in the San Fernando & Los Angeles area. Product availability may vary. Contact us for the most current availability on this product.